Call me crazy but I've cast on a new project. I know, I know, I have that cowl, that sweater and the never ending scrap sock blanket. However, I was sitting and thinking-I do that at times-about some lacy shawl knitting. I'm hopefully going to have a finished shawl for my daughter to wear at her wedding even though she says it's okay to not have one. The project page is here. I have high hopes of having it completed in two weeks for her bridal shower but the realist in me knows I'll be wrapping up an unfinished shawl. That's okay, I learned from my mom that "in progress" presents are just as sweet. The yarn is a blend of kid mohair and merino which my daughter picked out while we were at a fiber festival last year. This is my first time knitting with kid mohair and so far I'm getting used to the "halo" of the yarn. I guess my first love is silk blends. On my reading progress, I've finished Persuasion! I cannot read classics right before bed, I fall asleep and my attention is wavering while reading. I did enjoy the novel and the tidy romantic ending that Austen is famous for. In my photo is my latest issue of Taproot. Thoroughly savoring these pages. loved this issue of Taproot, too!!! I know you're going to fly through that shawl!!! Lovely thought even if she doesn't wear it. My Taproot is lost in the wind so another has been sent out, I hope it gets here soon. Thank you for turning me on to Taproot! I really enjoy it. I know my dad will when I finish I plan on passing it on to him. I love all that lacey knitting. So delicate looking! Can't wait to see it finished! :) Happy knitting. love the start of your shawl, so delicate. I have never heard of Taproot before. I have The Mermaid's Chair by Sue Monk Kidd on my Kobo at the moment. Your daughter will love the shawl, and I'm sure she won't mind if it isn't finished in tim for the shower. I've never looked at the ataproot magazine. I need to see if I can find one. Have a great week! Like you, I'm a fan of silk blends, but the yarn you've chosen will make a light and ethereal shawl. Lovely! that is lovely yarn! so soft and delicate looking. I love the look of that yarn you're using. I've not knitted a yarn with a halo before, it's going to look wonderful combined with the delicate lace pattern. I have a good feeling that we will see your daughter's wedding pictures with that shawl on her shoulders. It's a real pretty pattern. And great for knitting at this time of year. The yarn looks lovely - very special! I have only just ordered Issue 13 of Taproot here - we are always a bit behind in Australia! This issue looks great - it will be be a while before I get hold of it though! I've been naughty too and cast on something new. Sometimes you just have to have a change! One of these days I am going to find a way to buy one copy of taproot to look at and decide if I want to shell out the money for a subscription! I think you shawl is beautiful and with lace I imagine that is several hours of work right there! What a treasure that gift will be. What a beautiful shawl it will be! 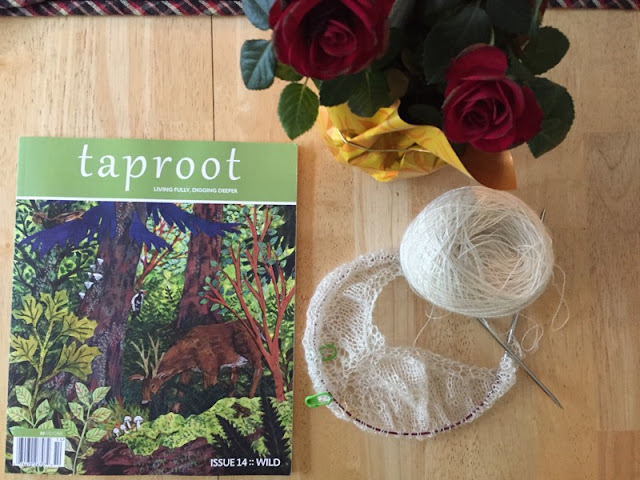 Love Taproot....looking forward to spending some time lingering over this wonderful issue! Happy Knitting! The shawl looks fantastic and the yarn glorious - love the colour. I love that you're making a shawl for your daughter's wedding! What a precious gift! Such a wonderful gift, made with love. Exciting times, the wedding is getting so close now. I have always bounced back and forth about getting Taproot and this episode they have crochet rocks! Argh! I would love to know how to do that! I think next time I have some cash in my stash, I'll spring for a subscription! Lovely!!! I wish you all the best for this beautiful gift!!! God bless you!!! 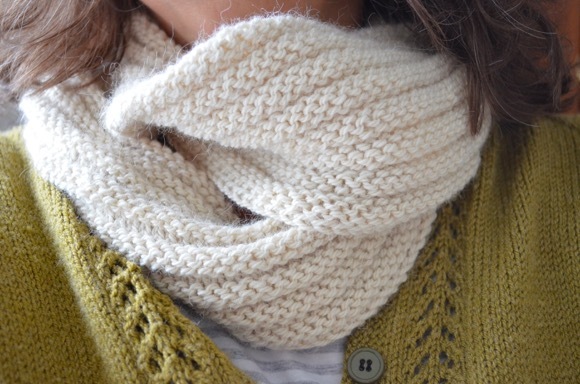 The shawl will be lovely and youvare such a speedy knitter that you will finish in time! I am enjoying this issue of Taproot, right up my alley :) I am not surprised you cast something else on Karen, if anyone can handle a few projects on the go, it is you :) Have fun! The shawl will be beautiful and very special. Lovely yarn. It's going to be a gorgeous shawl. That looks like it is going to be a beautiful light and lacy shawl. Good luck in getting it done. I'm anxious to get a copy of Taproot too. I love Amanda and all the beautiful work she does. Your shawl is going to be beautiful! The wool is gorgeous - your daughter is going to be thrilled. You knit so fast you will be done with time to spare. 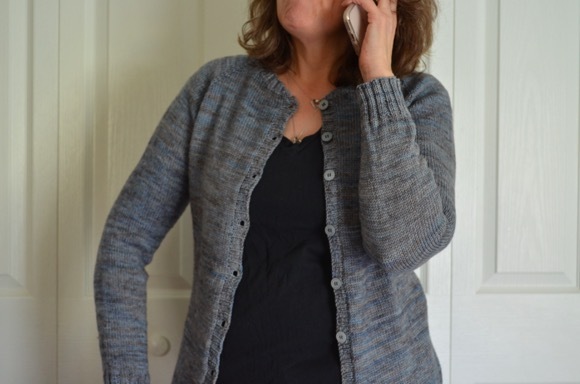 You picked a gorgeous pattern and yarn! I say the more projects the better ... keeps your interest going and you don't get bored that way. That's my rationale anyway, lol. Your daughter is one lucky girl to have a wedding shawl made for her and it will be a beauty! I really need to check out Taproot. What an awesome gift the shawl will be. I hope you'll share pictures of her wearing it on her wedding day. I think that making a wedding shawl is such a lovely idea. It is something for her to treasure and hand down to her children. helpful when you actually want to read! The wedding shawl will be perfect, even if not complete "in time" so don't sweat it. I don't blame you for casting on a new project, especially such a pretty one. Now that summer will soon be here I'm planning cotton bags and cool cardigans instead of the dark coloured heavy lopi pullover that I'm working on. How wonderful to be making a family heirloom. I can't wait to see the finished shawl. That shawl is so refined. Just love it, so delicate... like a soft hug. Oh how I've been enjoying the latest Taproot s well. Probably one of my favorite issues in the last year.